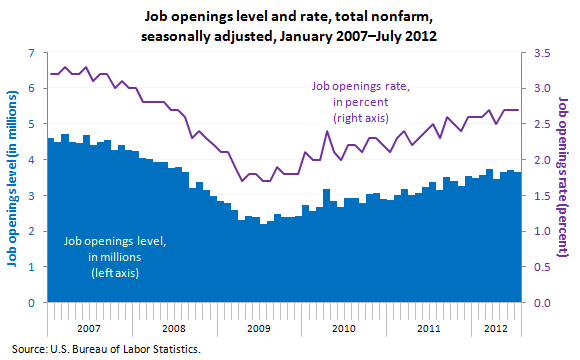 There were 3.7 million job openings on the last business day of July 2012, little changed from June. The number of openings was little changed in all industries except health care and social assistance, where the number decreased. The number of openings also was little changed in all four regions in July. The level of total nonfarm job openings in July was up from 2.4 million at the end of the most recent recession in June 2009. The job openings rate—2.7 percent in July—has trended upward since the end of the recession in June 2009, when the job openings rate was 1.8 percent. These data are from the Job Openings and Labor Turnover Survey and are seasonally adjusted. For more information see "Job Openings and Labor Turnover — July 2012" (HTML) (PDF), news release USDL-12-1831. Data for the most recent month are preliminary. More charts featuring data on job openings, hires, and employment separations can be found in Job Openings and Labor Turnover Survey Highlights: July 2012 (PDF). Bureau of Labor Statistics, U.S. Department of Labor, The Economics Daily, Job openings in July 2012 on the Internet at https://www.bls.gov/opub/ted/2012/ted_20120912.htm (visited April 24, 2019).